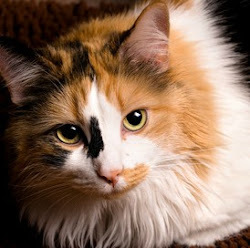 Thomasina's Purrls Of Wisdom About Cats: It's Halloween! Are You Scared Of Black Cats? It's Halloween! Are You Scared Of Black Cats? Why are people scared of black cats? Good question! I've often wondered why people are scared of black cats, too. I'm mostly black (well, not really), and I'm not scary at all. Unless I'm angry about something. Then I'm really scary. Ask Belle about that. My human typist researched this because she's always wondered why people are afraid of black cats, too. Turns out that all the superstitions about black cats began with an evil fairy named Cat Sith. Celtic mythology (not sure what that is, but anyway...) has it that he did some very nasty things, like stealing dead people's souls before the gods could claim them. Eeeuuu... Too bad he made himself look like a huge black cat when he did that. Then there were the people who thought black cats were witches' familiars and helped them cast evil spells. Oh, and some people thought witches could "shape-shift" so they looked like black cats wandering around town causing all kinds of trouble. Yikes!! No wonder so many people were afraid of black cats. Cats aren't superstitious. 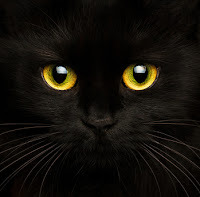 But if we were, these are the superstitions about black cats I'd believe. -- Sailors thought a black ship's cat would protect them. And fishermen's wives thought having a black cat at home would keep their husbands safe. -- Some people think a black cat walking towards you is good luck. But a black cat walking away from you is taking your luck away. -- In Germany a black cat crossing your path from left to right is good luck. You don't want a black cat to cross your path from right to left though. -- In Scotland, having a black cat on your porch is a sign that you'll be very prosperous someday. -- In Japan, people think a single woman will have many suitors if she lives with a black cat. 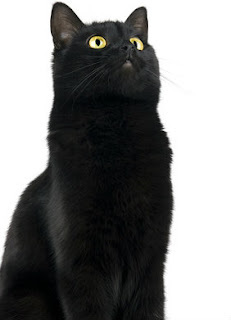 -- And in the English Midlands, giving a black cat as a wedding gift is thought to be good luck for the bride. I just asked my human typist, and she said she's not superstitious either. But she loves black cats because they're so beautiful and considers herself very lucky to know some. I hope this helps, Nellie, and you're not so nervous now. Oh, and from all the cats of many colors in your neighborhood and me, happy Halloween!